Usually it's Fooditka who "suggests" a place for us to check out and potentially review for the blog. However this time, it was my idea to check out Taco Pedaler's happy hour. I first noticed their new brick and mortar spot a few weeks back and wanted to stop in, as I love a good taco every now and again (and again and again and again). Taco Pedaler started their existence as a mobile food business based on N. Mississippi, selling tacos and other simple Mexican dishes from signature cargo-tricycles all over Portland. A permanent home somewhere was the logical next step, and they set up shop on N.E. Broadway between 22nd and 23rd. They did a great job with the space, and the building itself is a vibrant and eye-catching addition to the immediate neighborhood. The colorful outside is adorned with one of their unmistakable bikes above the front door, and an artist's rendering of one on the side. The interior is also really nice, with a lot of finely finished wood and authentic looking details. It feels a lot like a no-frills Mexican cantina that some skilled artisan spent a lot of time getting perfect. There are several tables inside and more outside for when the weather is nice, although the outside tables are a tight squeeze. The menu is pretty straightforward; in addition to tacos they offer chips and salsa/guacamole, as well as items called "Dillas." They are kind of like empanadas, made out of a taco shell folded over and stuffed and then deep fried and grilled. We got some of each, plus I ordered a michelada. They have a full bar, so...yay. Salsa, Guac and Chips - This was a solid opener. 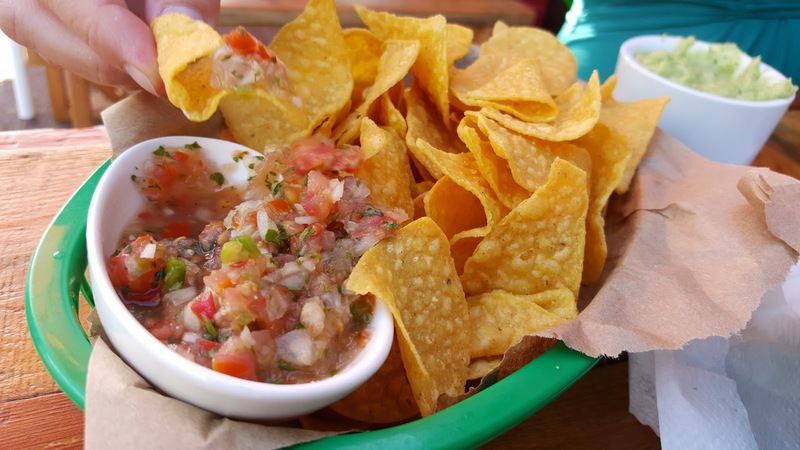 Hard to really go wrong with salsa and guacamole, but they definitely do a fine job. I actually preferred the guac to the salsa, which is interesting because usually I'm the other way around; it was just the right texture for me. Dilla - It looked as good as it sounds. Golden brown, crunchy and oozing all of its molten goodness out of the middle once bitten into. Unfortunately, I didn't ask for a taste quickly enough. By the time I thought to try a bite, Fooditka had already devoured it. Next time I go, I'll have to get my own. Tacos - The bread and butter of any meat and potatoes taco shop should be its tacos. Too many cliched food metaphors? Maybe, but you get the point. This is certainly true in Taco Pedaler's case. Their tacos are strong, with delightfully authentic soft corn tortillas and a generous amount of filling in every one. I ordered one each of the beef, the pork and the chicken. I'd have to say I preferred the first two over the last. In my honest opinion, I thought the chicken was a tad dry, although still made for an excellent taco after I garnished it up with some of their awesome house hot sauce. The beef and the pork were outstanding though and covered with some sprigs of cilantro and lime juice, the overall effect was delicious. I'm for sure going back sometime soon. This is another of those order and pay before you sit and bus your own table kind of places, so the actual service was minimal. Everyone there was very friendly though, and my michelada was a good one. We went during happy hour, which is 3-6 p.m. so our total bill was very reasonable. Dinner for both of us was less than $20.00.